Smartapp app is one great app which can be used to pay your mobile phone bills or topup your prepaid sim. 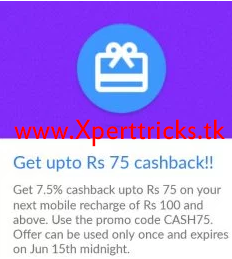 It is now offering flat 7.5% cashback on transactions above Rs 200 and the best thing is that it is valid even for existing users and for Airtel customers also. So hurry up and avail the offer now. How to get cashback on postpaid bill Payment ? 5. You will get a confirmation message and now make payment with suitable option. Thats it !! Voila !! You have successfully recharged your number.